As you may know from the travel category of my blog, the summer just gone I was lucky enough to visit the country of Montenegro (Budva to be exact), which opened my eyes to that area of Europe and has since had a place in my heart. Whilst out there, I actually saw it as a place possible to live in, as opposed to the common places of Spain, France etc. and could see myself living there. I was recently contacted by Expacare, who had read my post and were interested to find out more, along with some photos of my travels. 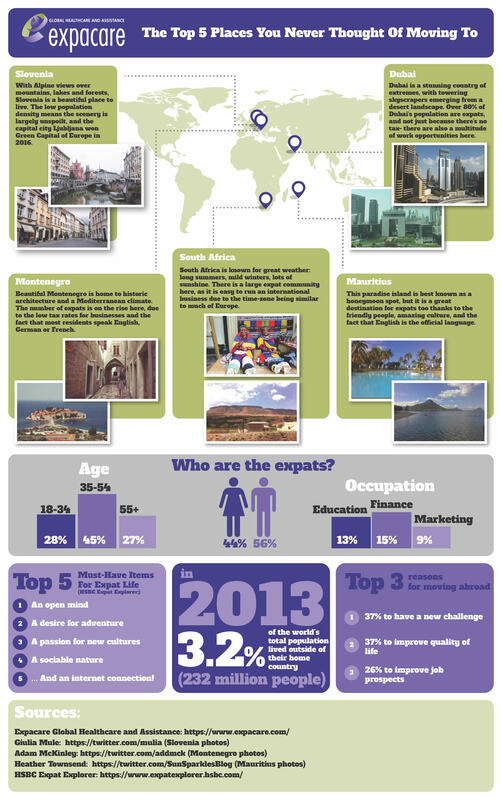 I was delighted with the outcome and having Montenegro as one of their choices for Expats gave me a sense of pride, featured with places like South Africa and Dubai, so I’ve decided to share their infographic with you. Definitely looking up Dubai for future reference. I was already considering due to my husband’s residence permit but it seems ever so tempting even if we weren’t in this situation.